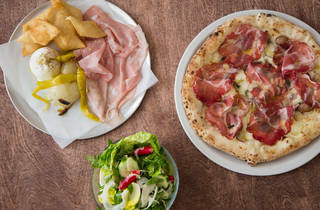 Tiptop Neapolitan-style sourdough pizzas in Camberwell. 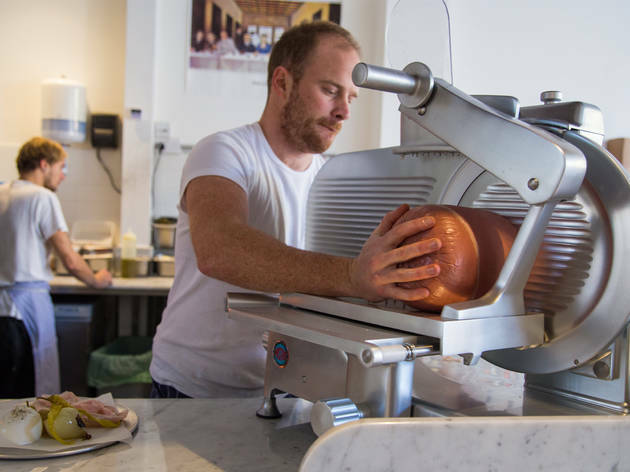 Sourdough pizza giant Franco Manca now has 18 restaurants across London, but one bit of the city not yet coloured in on the chain’s floury Risk board is the south-east. 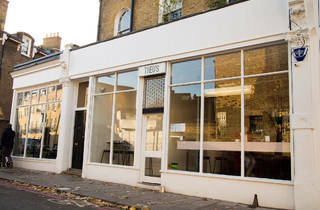 Perhaps looking to beat them to the punch, Theo’s is a similar set-up, dishing up Neapolitan-style sourdough pizzas and very little else. Another south-easter, 400 Rabbits, has already hopped into Crystal Palace, but Theo’s has made itself the crown pie-prince of Camberwell. 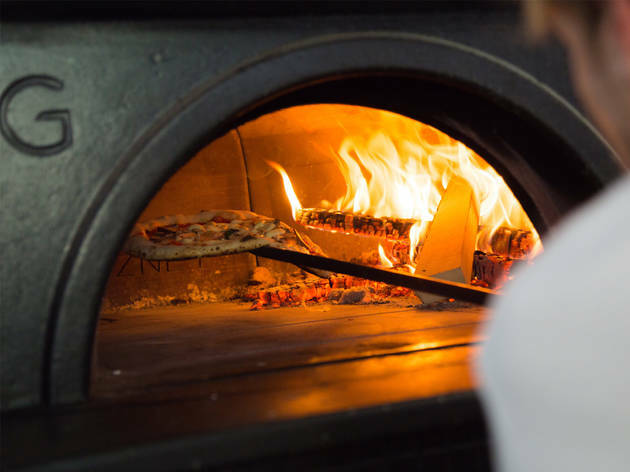 Unmissable as you walk through the door is the dome-shaped, wood-fired brick oven which ensures that the pies are done just right. Crusts are soft and chewy on top and crisp underneath, with welcome hits of bitterness from the odd charred spot. 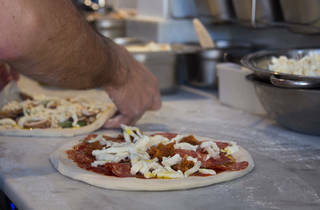 Toppings include aubergine, anchovies and various kinds of pork – and come piled high. A little too high in some cases. A veg-heavy special of chestnut mushroom, blue cheese and leek soon turned soggy in the middle as the over-abundant greenery perspired into the base. It’s better to focus on the more straightforward stuff. The wonderfully cheesy garlic pizza bread (misleadingly labelled as ‘focaccia’ on the menu) showed that Theo’s is capable of doing great things with simple ingredients, and suggests that the £5 lunchtime panuozzo (essentially a pizza sandwich) is also worth checking out. Pies range in price from £6.50 for the margherita to £10 for meatier options. More-than-serviceable house wines come by the 500ml or litre jug. Or partner your pie with entry-level craft offerings from Kernel and Orbit. And check out the short, Italian-leaning cocktail list. If you do, be sure to sit in and make it a leisurely lunch. With its bare, whitewashed walls and marble-topped tables, eating at Theo’s is a bit like chowing down in an art gallery but minus the stuffy discomfort. 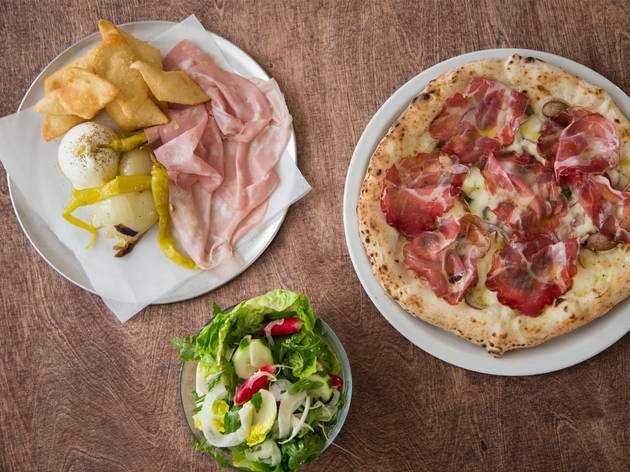 The atmosphere is very welcoming, and everything’s keenly priced – not Manca-level cheap, but still, no dish comes in over a tenner. And staff are as cheery as you like. So watch your back, Franco – Theo’s has taken SE5, and in some style. My husband and I went here for dinner last week. I had the wood oven aubergine and he had a meat-based pizza. (Sorry, so veggie, so not paying attention!) The place was slammed so I forgive the long time it took for our pizzas to arrive. Both looked lovely and are quite large, which I think justifies the price. Mine had a very good amount of aubergine and basil leaves sprinkled about. The dough also had a good chew factor but the bottom was too burnt, which seems the trend for London pizza today. As a native NYer, I disapprove. Despite the generous cheese topping as well, the pizza was just fine. Not poor, not great. Just fine. I’ve had much better at Yard Sale, Joe’s in Clapham and Pizza East. My husband though loved his pizza. Also I have to give props to the manager for giving us 20% off the bill because it took a while for our pizzas to arrive and we were seated at a chilly place by the windows. Very good customer service in offering that discount. Terrible people. You'd think they know about small businesses. Theo's?? Theobalds?? Theodore's?? Awful money grabbers. Best pizza south of the river. And excellent wines (the scillian house white is a dream). Amazing pizza, atmosphere and service. The cocktails are delicious too! I especially love the smiley member of staff Laura who always refers to me as "babe"- so friendly! Also, if you fancy a beer in the storm bird Theo's let you take the pizza over... always thinking about the customer! Simply the best staff, pizza, food, the lot! Wonderful to have such great pizzas in Camberwell. Great simple menu, wines and puds. Love this place. Always fantastic tasting pizza. Always drop in for a feed when in UK all the way from Australia. Amazing Food and Design that really fits the area. Not pretentious. Feels like a local restaurant despite being new and having amazing food. Great effort on their part. 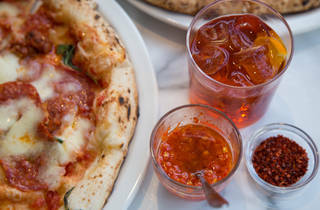 The best Neopolitan pizza in London. Great chilli tomato sauce too! Lovely garden and relaxed atmosphere. Once you go here, you will never again set foot in one of the many tired, boring Pizza chains in London. Time to reclaim authentic great food. 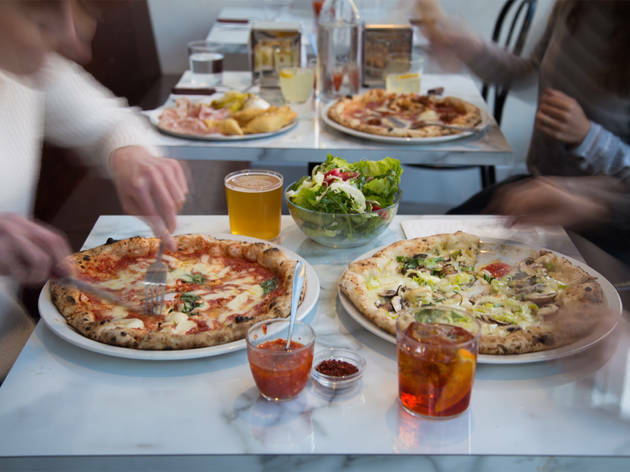 Incredible pizzas, good drinks and delicious puddings. I'm out of the country for a year and this will be the first place I go on my return. Delicious pizza, love that they serve loads of chilli on the side as a chilli fiend! 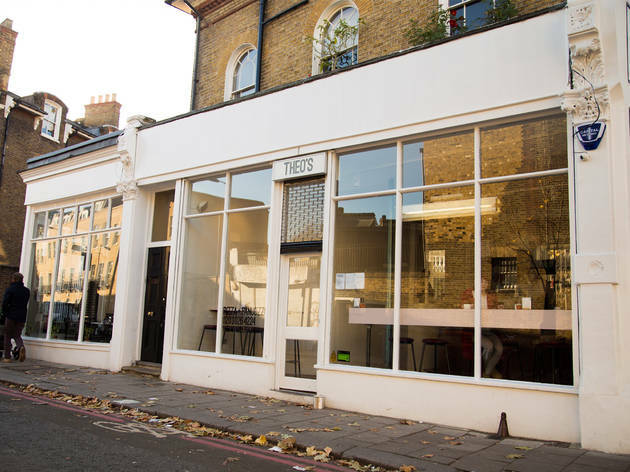 Since opening in October 2015 Theo’s has become a bit of a local legend, regarded as the best pizzeria in SE5 and beyond the boundaries of Camberwell. 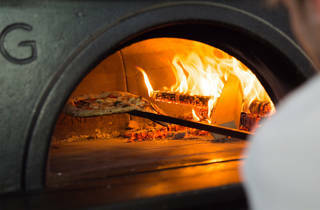 Theo’s offers great wood fire oven Neapolitan-style sourdough, with a host of delicious authentic Italian toppings that are a bit more unusual than regular pepperoni. Plus attentive and friendly staff are more than happy to explain if you don’t know your ndjua from your soppressata. The restaurant is ultra minimal with bare white walls and high ceilings, and even though it’s compact it’s cosy; there’s a nice relaxed atmosphere amongst diners and staff. Our extremely friendly waiter was really helpful in recommending toppings and which of the Italian themed drinks to try. In particular he highlighted the Grappa di Moscato, which he warned was like drinking a shot of fruity petrol, but was fun to try anyway. It was fruity, it was like petrol, but, the entire meal included, it was fun. Pizza more pricey and almost burnt on the bottom. Common feature to many Neapolitan-style sourdough pizza restaurants - same problem at Franco Manca and other pizza places. That happens not because they're too slow or not fast enough to take the pizza out of the oven. That happens because you need to clean the surface of the oven with a dump cloth from time to time. Leftover flour on the pizza's bottom burns easily burning the pizza itself. That makes your pizza burnt - not very healthy - and most of all - unfortunately for the taste - very, very bitter. Mine was half burnt. Partner's one almost inedible. Shame! 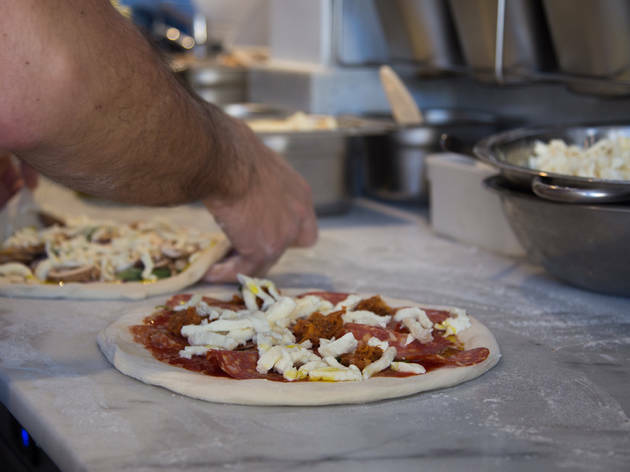 As the main Time Out review mentions, Theo's Pizzeria is nipping at Franco Manca's heels for best sourdough pizza in London. 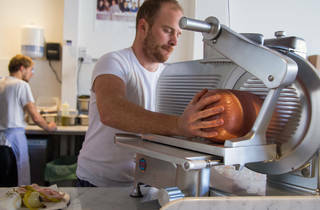 But in the tangled web of the London pizza scene, there's another thread linking Theo's Pizzeria to another well-loved establishment: the eponymous owner is the former head chef of Pizza East and the resulting pizzas at Theo's are a beautiful hybrid of Franco Manca's flavoursome dough and the toppings with a British twist. 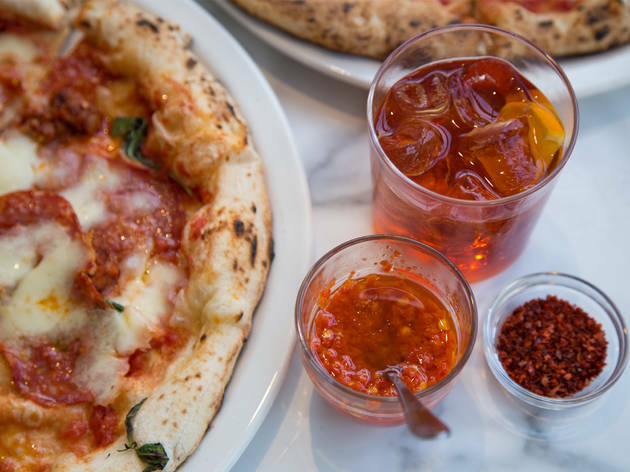 The standout pizza is the Camberwell scotch bonnet 'nduja pizza - spicy without being a challenge and the use of scotch bonnet brings a nice zestiness that works well with the tang of the sourdough crust. Whilst the pizzas are the main attraction here, just as much care has gone into the sides: we had the potato and mozzarella croquettes and the beautifully dressed little gem side salad. Also of note is that Theo's offers a vegan pizza: a simple marinara pizza. Overall, it's great pizza for a reasonable price - a meal for two with a starter, two pizzas, a side salad and two drinks came to a little over £30. Lovely pizza, but no 250 ml glasses and very, VERY cold in the winter. Genuinely the best new pizza place on the block! Absolutely perfect salami pizza, slightly spicy perfect marinara sauce and chewy base with slight singe from the woodfire oven. The service was relaxed and attentive, drinks were well made and reasonably priced. The room has high cavernous ceilings which means it doesn’t over heat in the restaurant too (sounds stupid but common problem in small pizza restaurants and I hate being hot). One small thing- we tried the special, a mash potato pizza and it was just not very good… shame because they seemed very proud and everything else was perfection! Maybe I’m too pizza-purist! Simple and flavoursome, those pizzas are perfect on a cold and rainy winter night. Or any other night, really. Simple menu, simple dishes, but with quality ingredients and friendly service. All adds up to a brilliant, down to earth and cheap meal. 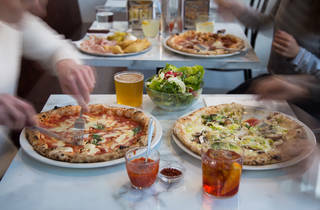 One of the best neapolitan pizza place!